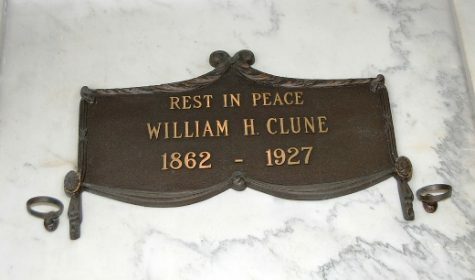 A bitter, unyielding battle between two women—one the mother and the other the wife—was to blame for the death of Harry Addison Love, a 46 year-old businessman. 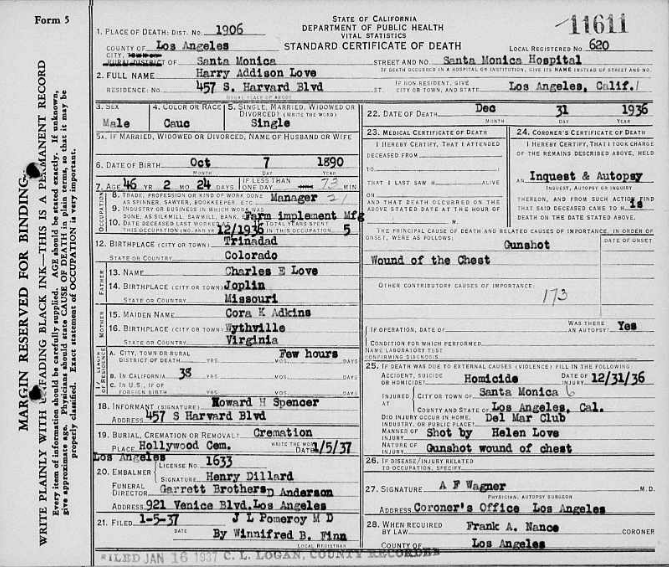 Love, who was born on October 7, 1890, was the son of Charles (d. 1923) and Cora Adkins Love and the brother of Esther Love Spencer (d. Dec. 7 1929). Esther’s widowed husband Howard and their two daughters, Virginia and Janice, now lived with Cora and Harry at the family home at 457 South Harvard Boulevard (demolished). Reportedly, Love married 31-year-old Helen Wills in a small Mexican town on May 3, 1936. On their return to Los Angeles, Helen expected Love to reveal their marriage to his mother. He refused, even threatening her. Instead, he rented her a house at 3613 West Fourth Street, but did not live there all the time, alternating between there and his mother’s home. Helen pleaded with him to acknowledge her as his wife, but he was adamant. She knew that her new husband had plenty of money, but he was secretive about his affairs. Helen did not care. “All I wanted was to be acknowledged as his wife,” she said. In September 1936, Helen became ill (she said it was from worry) so Love sent her to New York for two months. When she returned, she discovered their framed marriage certificate had disappeared. Love told her he placed it in a safety deposit box for safe keeping. When the holidays came, she wanted to spend them alone with Love but he insisted that they have Christmas dinner with his mother. Love took his wife home for Christmas but did not introduce Helen as his wife. After dinner, Love and his mother politely sent Helen home alone while they went to church to listen to Christmas carols. The next day, Helen was pleased when Love promised that they would spend New Year’s Eve together at a club in Glendale. “I was almost delirious with happiness,” Helen said. “I bought a new gown. I showed it to his mother.” Wrong move. However, that happiness was short-lived. Without warning, Love told his wife that he had included his mother in their New Year’s plans. 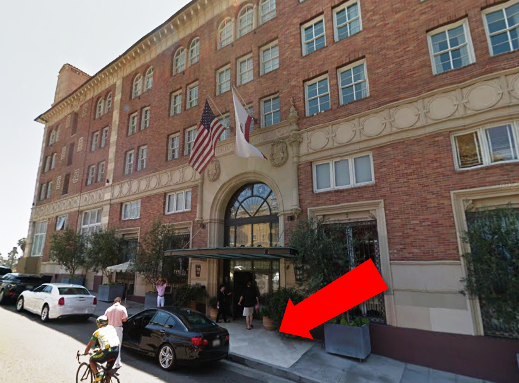 The three of them would go to the Del Mar Club (Casa Del Mar) in Santa Monica. Helen was disappointed. “Since when do we need a chaperone?” she asked. “You don’t understand my mother,” he said. When an argument ensued, he told her that because of “financial matters,” he would be going to dinner at the club with his mother, and she would have to make other plans. Then he left. On New Year’s Eve, Helen met with Love at a building his mother owned at 3020 Main Street. Once again, he refused to take her to the party that night and drove her to a garage where he left her, instructing the attendants that no one was to use the car but him. Helen sat in the car for hours. Finally, an attendant told her it would be better if she went to the office, which she did, but not before taking a pistol which Love kept in the car. She went home, and then decided to take a taxi to the Del Mar Club. She took the gun with her. When she arrived, the clerk told her that Love and his mother had not yet arrived. She would wait. Shortly, Love came from the dining room. “Hello darling,” she said to her husband. “What are you doing here?” Love asked her. Then, when Helen reached into her purse, Love screamed and turned to run. With the gun in hand, Helen ran after him. Love reached the steps of the club when Helen fired. Love fell back down the steps, jumped up and ran. Helen ran after him as he circled around the block, firing two shots at him as he fled. Love dashed towards the Del Mar Club’s entrance. A third bullet felled him on the sidewalk just in front of the doors. Harry Love collapsed after being shot by his wife, Helen Wills Love. Employees of the club carried him into the lobby and placed him on a couch. 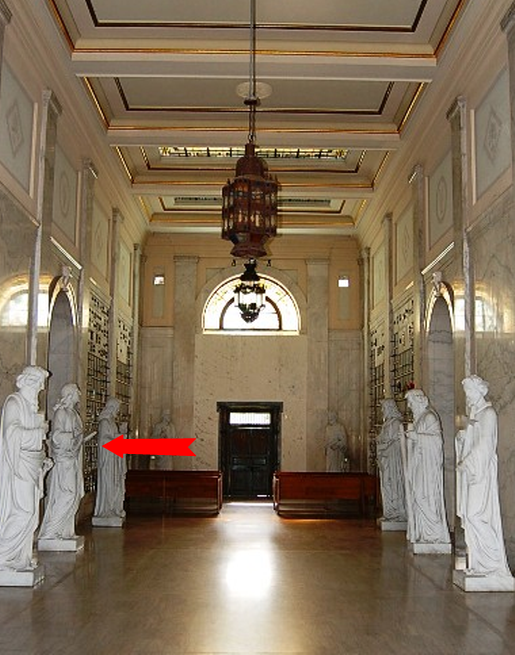 Helen followed them into the lobby and stared dazedly at her dying husband. She later told police, “I loved him so that I was not going to give him up.” Harry Love died in the ambulance en route to Santa Monica Hospital. 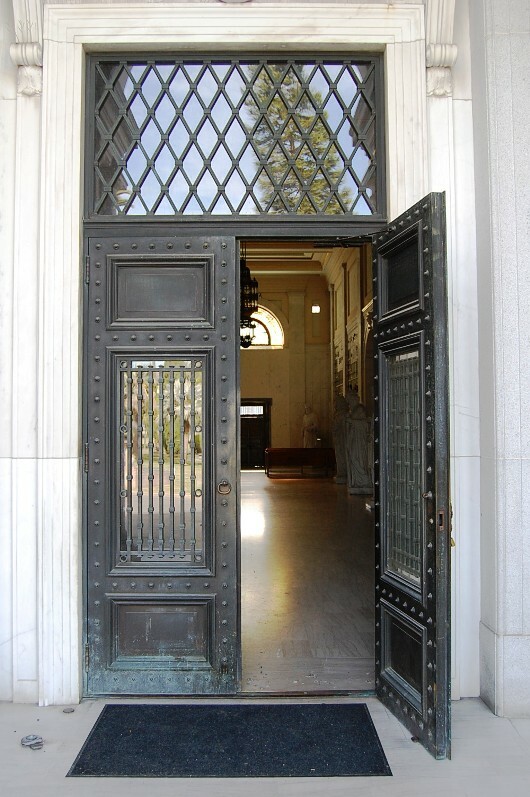 Later, when Helen was taken to the women’s quarters of the Santa Monica City Jail, she knotted a silken scarf around her neck and lashed the other end to a bar of the prisoner’s room in an attempt to take her life. Once revived, she was taken to County Jail. Harry A. 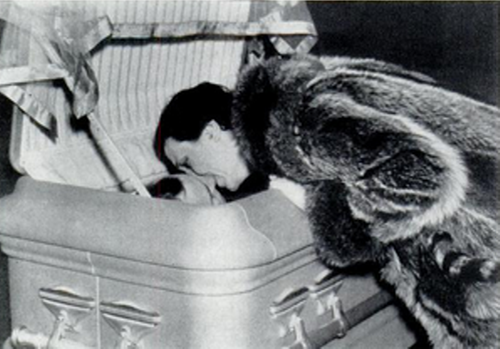 Love, goodbye in his coffin. 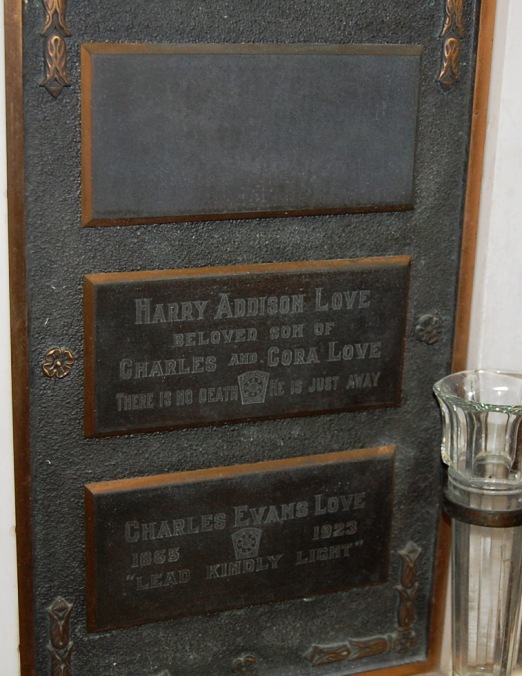 Funeral services for Harry Addison Love were conducted at St. James Episcopal Church (Wilshire and St. Andrew’s). 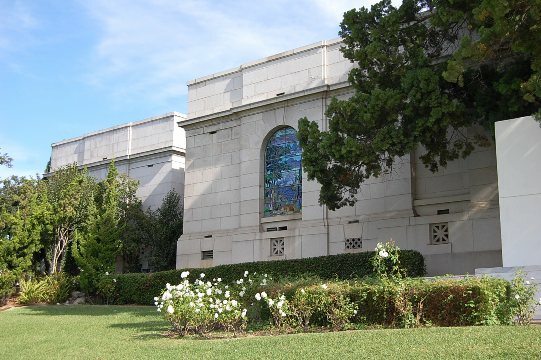 His body was cremated and his cremains were placed in the family niche, along with his father’s, in the foyer of Hollywood Cemetery’s Cathedral Mausoleum. 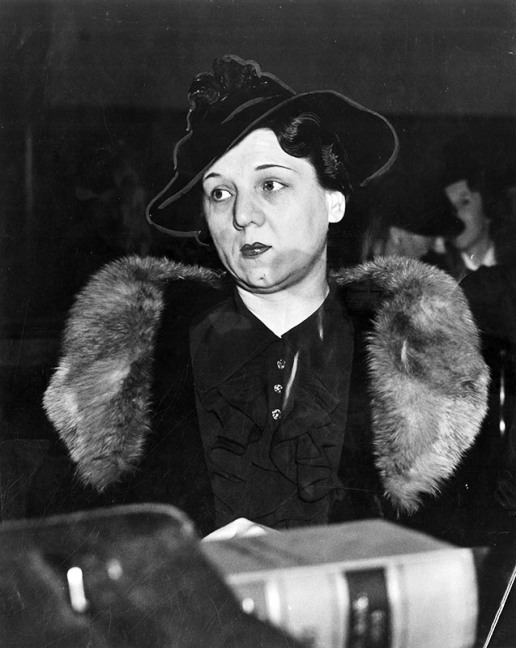 Over the next several months, Helen was arraigned and put on trial during which the prosecution contended that the shooting was a planned murder, motivated by the fact she was a “woman scorned.” But the defense attempted to show it was a hysterical and accidental episode arising from the jealousy of Cora Love, mother of the slain man, who would not acknowledge her a daughter-in-law and fostered the estrangement. Helen testified that she had been intimate with Love for many months and became pregnant with his child which resulted in their secret marriage in Ensenada, Mexico. Evidently, she lost the baby shortly after. From then on, Cora Love estranged her son’s affections (which Helen called a “mother complex”) in a series of acts which reached a climax on New Year’s Eve. She testified that the shooting was accidental because the gun went off as Love attempted to take it from her. The prosecution, however, produced eye witnesses who claimed that Helen pursued her husband outside the club and deliberately shot at him. Helen Wills Love was convicted of Second-degree murder by a jury of eight women and four men. Helen, who wore the same black outfit throughout the trial, appealed to the judge to pronounce sentence at once so she could change her plea to murder because of insanity. Helen believed she would receive a new trial because one juror was declared to be intoxicated during the trial by the County Jail physician. The juror was dismissed (sentenced to five days in jail and fined $100) and an alternate took her place. She was also told that some jurors read newspapers during the proceedings and was told by a stranger he was told of the verdict prior to the end of the trial. But sentencing would have to wait. That morning, Helen was found to be in “self-imposed state of coma.” Evidently, she had told cellmates that she could end her own life by merely willing herself to die. 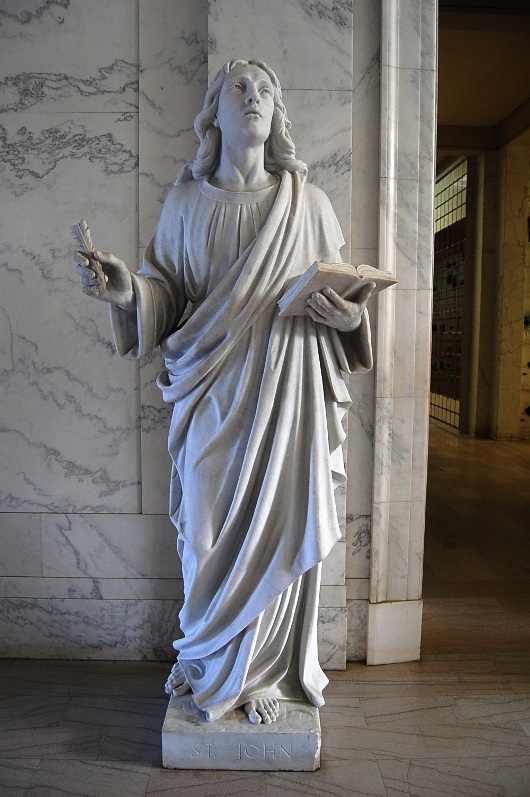 Physicians tried everything to awaken her and were mystified at her condition. Finally, after more than a week she was revived and pronounced sane. The next day, Helen was brought into court on a wheelchair and sentenced to Tehachapi prison for from seven years to life. Oddly enough, the following year, Cora Love obtained a permanent injunction against Helen using the name Love. She was restrained from representing herself to have been the lawfully wedded wife of Harry A. 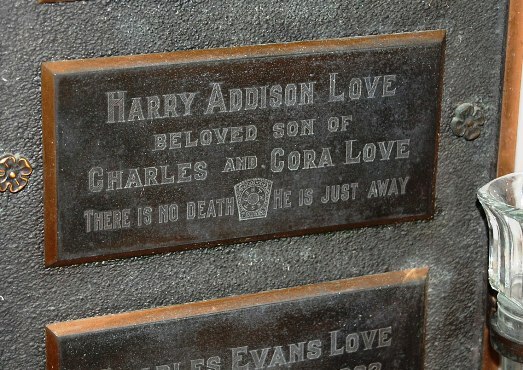 Love, or his widow and from representing herself to be the daughter-in-law or related to, Cora Love. 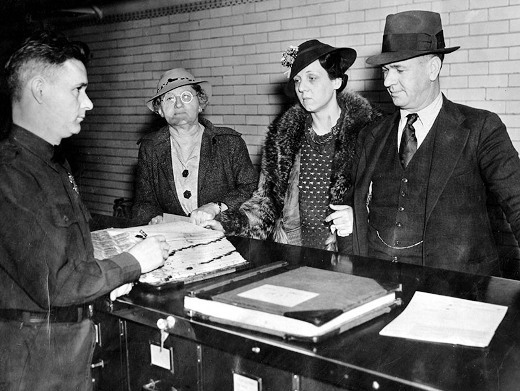 Since Love had allegedly put their marriage license in a safety deposit box for “safe-keeping,” Helen had no proof to defend herself. Full niche of the Love family. Notice that Cora’s maker (top) is blank. 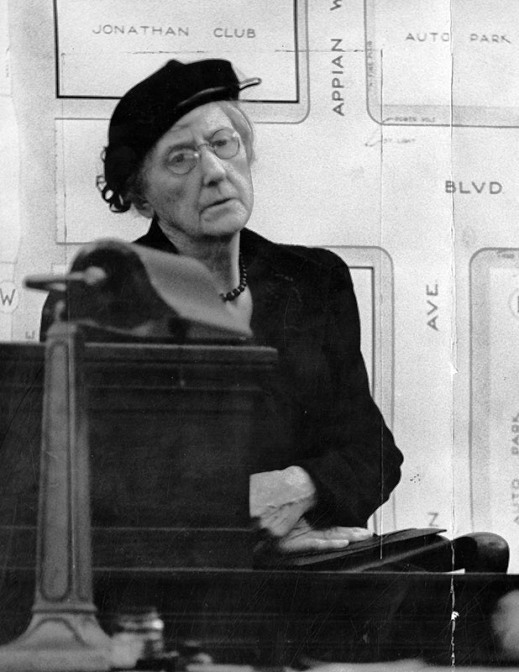 Cora Love died on November 11, 1950 while vacationing in Palm Springs. 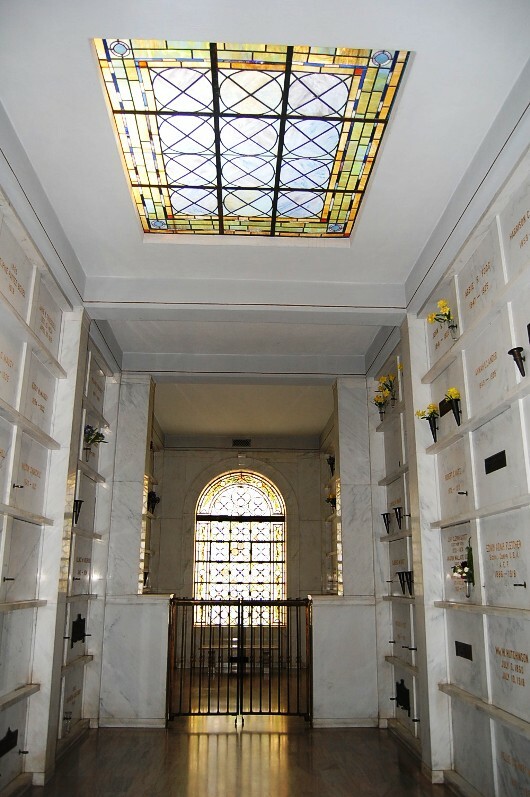 For some reason, her niche at Hollywood Cemetery was never marked, even though she had two granddaughters that survived her. Over the next few years, Helen applied for parole a couple of times, once in 1938, but was denied. She was told she would be eligible to apply again but it is unknown when she was actually paroled. Helen, if counting her “marriage” to Harry Love, had four spouses throughout her life. 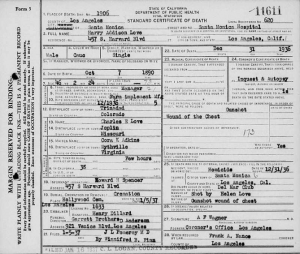 She died at 95 years of age as Helen S. McCullough on November 2, 2000 in Northern California. 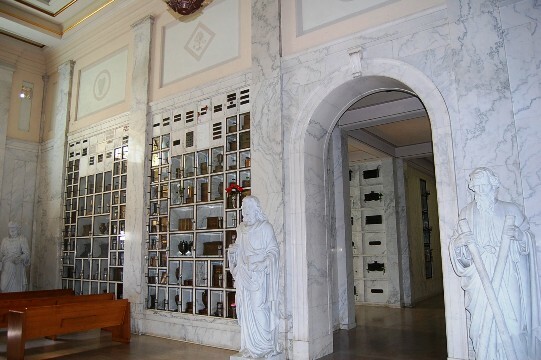 She is buried at Holy Cross Catholic Cemetery in Colma, California. 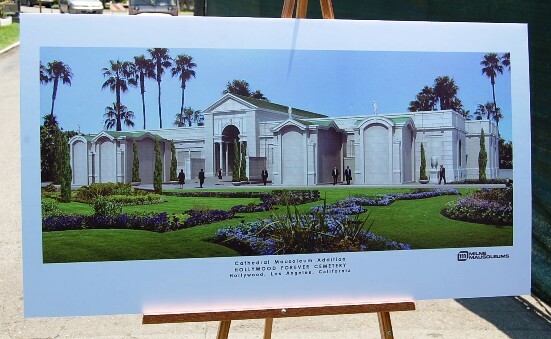 Above is artists conception of the addition of new crypts to the front of the Cathedral Mausoleum at Hollywood Forever. The above photo is from a recent auction of Anna Hill ephemera (thanks Dave). Considered the Toast of Milan, Annetta Saloski (née Anna Hill) blazed a brilliant trail for Americans in a land where only the greatest voices succeeded. At 18, her voice attracted such attention that she was sent to Milan with donations from the public to study under Sam Giovanni. Her debut at Teatro alla Scala(La Scala) as Marguerite in Faust resulted in a standing ovation. In the 1870s Hill was considered queen of sopranos. She made her American debut in St. Louis in 1885. 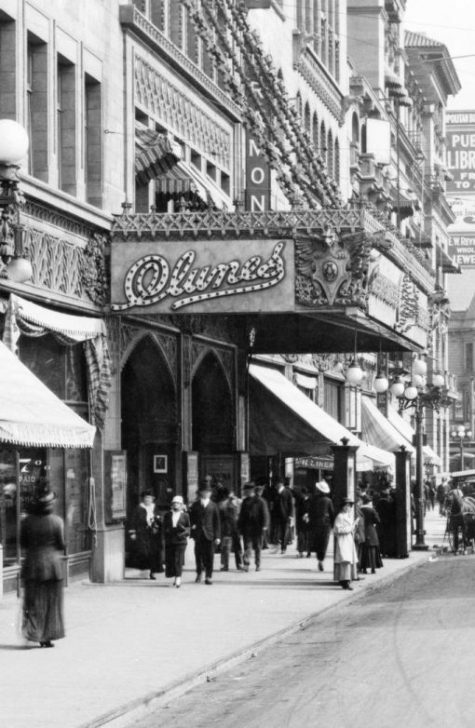 After scoring a marked success, she returned to Cincinnati her home city, to sing. Later she went back to Italy, where she married Oscar R. Giaccaglia. Hill sang in more than thirty operas, her most effective roles being in Faust and Traviata. She was a contemporary of Lillian Nordica and Clara Louisa Kellogg, leading American women singers, with Nordica following her in successful Italian appearances. She was at her zenith before the great Adelina Patti sang. Her husband was decorated as Chevalier of Civil Valor by the King of Italy soon after their marriage. They moved to the United States in 1913 and settled in Hollywood. 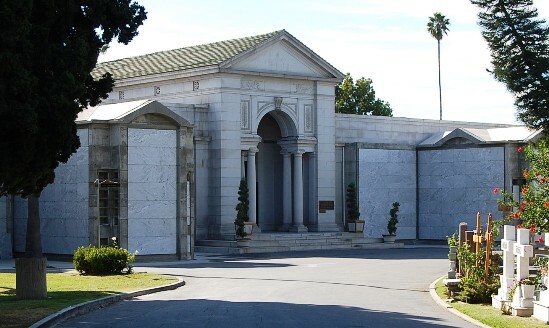 At the time of her death she was survived by her husband Oscar, who died in 1935, her daughter Pauline Giaccaglia Timme of Beverly Hills, a son, John A. Giaccaglia of New York and Leonard L. Hill, a brother. 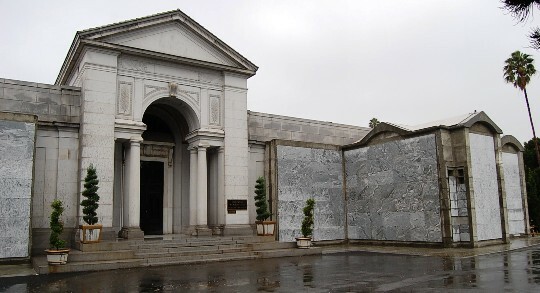 She is interred in the Cathedral Mausoleum at Hollywood Forever Cemetery, next to her husband. TUESDAY, May 6, is Rudolph Valentino’s 113th birthday. 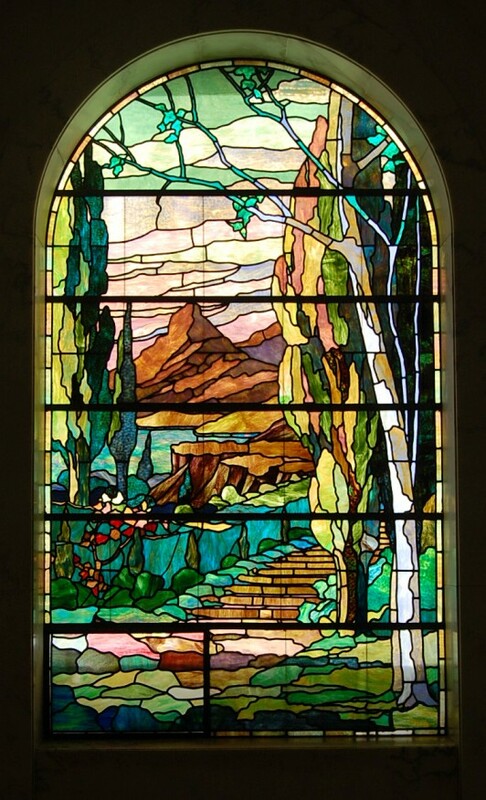 To celebrate you may want to pay homage to your idol this week at the following five Valentino places of interest. 1. Walk of Fame Star, 6164 Hollywood Boulevard, south side between Argyle and El Centro Avenue. Rudolph Valentino’s star on the “Walk of Fame” was one of the original 1,500 installed in 1959. 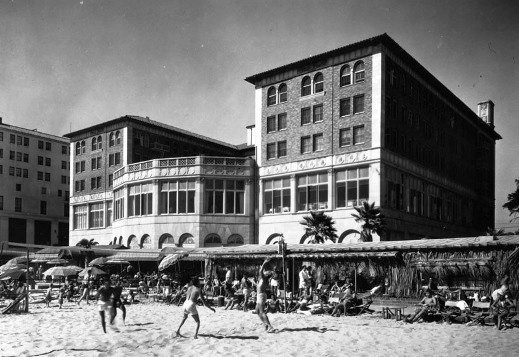 The spot where his Star is located was at one time the front entrance to the Hastings Hotel (formerly the Regent), built in 1925 by producer Al Christie on land where, many years earlier, he had filmed one of the first movies made in Hollywood. 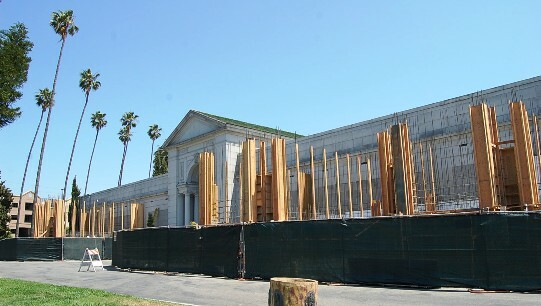 The hotel was badly damaged in the 1994 Northridge Earthquake and was demolished. 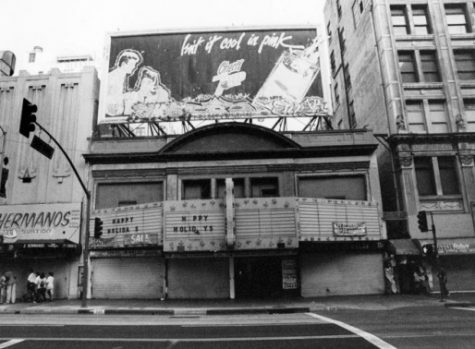 The site is now a parking lot used for the Pantages Theatre and nearby subway. 2. Hollywood High School Mural, southeast corner of Orange Street and Hawthorn Avenue. Located on the west side of Hollywood High School (1521 North Highland Avenue) is a large mural of Valentino in profile as The Sheik in full headdress blowing in the wind. Until the 1930s, the Hollywood High School athletic teams were known as The Crimson (in emulation of Harvard). It was around this time that a newspaper journalist wrote an article about one of the school’s teams and nicknamed them The Sheiks after “the brave warrior-lover hero in the Rodolf [sic] Valentino film classic of the 1920s.” After the article was printed, the school adopted the name, and they have remained “the Sheiks of Hollywood High” ever since. To view the mural travel south on Orange Street from Hollywood Boulevard. The mural is just past Hawthorn Avenue and overlooks the school’s football field. 3. De Longpre Park, south side of De Longpre Avenue between Cherokee Avenue and June Street. 4. 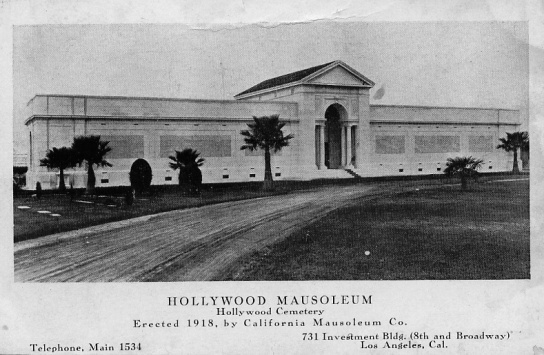 Lasky-De Mille Barn, 2100 Highland Avenue (across from the Hollywood Bowl). The Lasky-De Mille Barn is presently home to the Hollywood Heritage Museum. 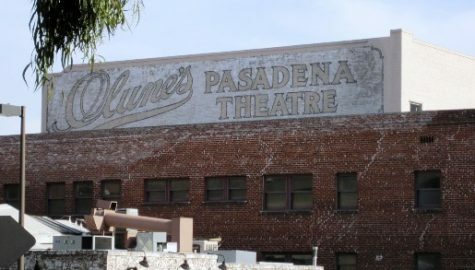 At one time this simple wood-frame structure was part of Famous Players-Lasky’s studio, and stood on the southeast corner of Vine Street and Selma Avenue. Built in 1895, the barn was where The Squaw Man (1914), the first full-length motion picture filmed in Hollywood by Cecil B. De Mille, was shot. 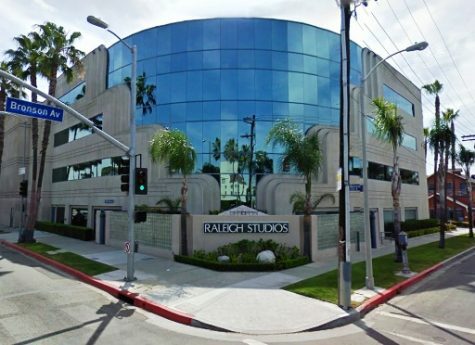 Valentino would certainly have used this building at different times during his tenure at the studio. There are also Valentino artifacts on display in the museum courtesy of Valentino collectors, Tracy Ryan Terhune and Stella Grace. For information on visiting the barn and museum, call (323) 874-2276 or (323) 874-4005. 5. 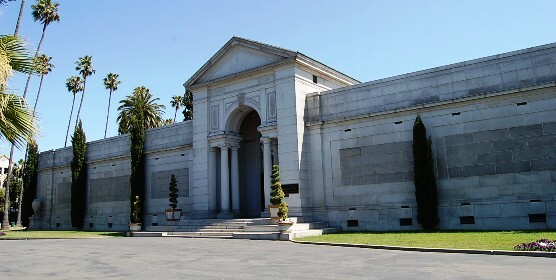 Hollywood Forever Cemetery, 6000 Santa Monica Boulevard, south side between Gower Street and Van Ness Avenue. 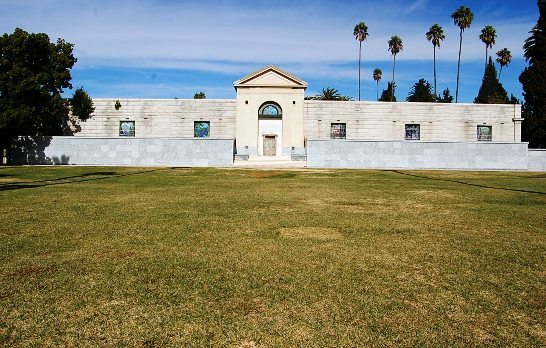 Founded in 1899, the former Hollywood Memorial Park Cemetery is the final resting place of Rudolph Valentino. 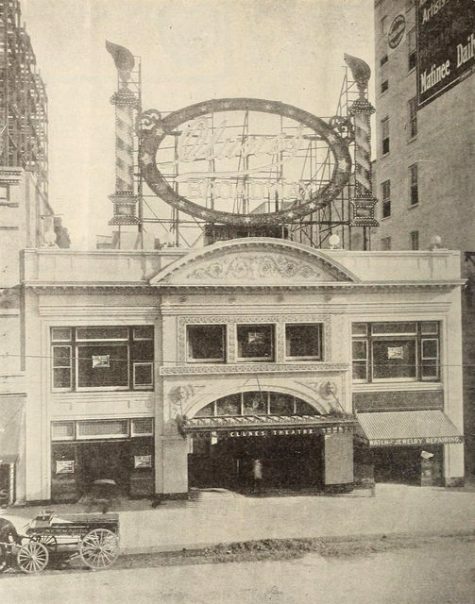 It is also the site of the annual Rudolph Valentino Memorial Service held each year on August 23 at 12:10 P.M., the time of his death in New York. 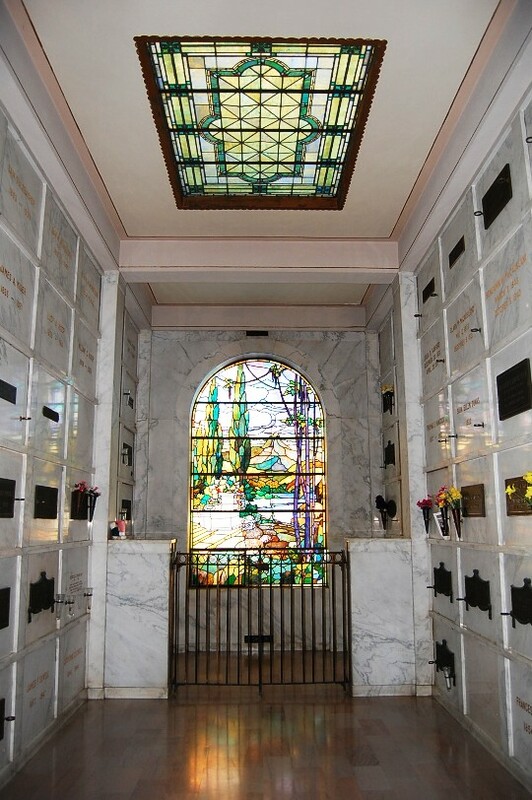 Valentino’s crypt, borrowed from his friend June Mathis who is lying in the crypt next to his, is located in the Cathedral Mausoleum, Crypt 1205. 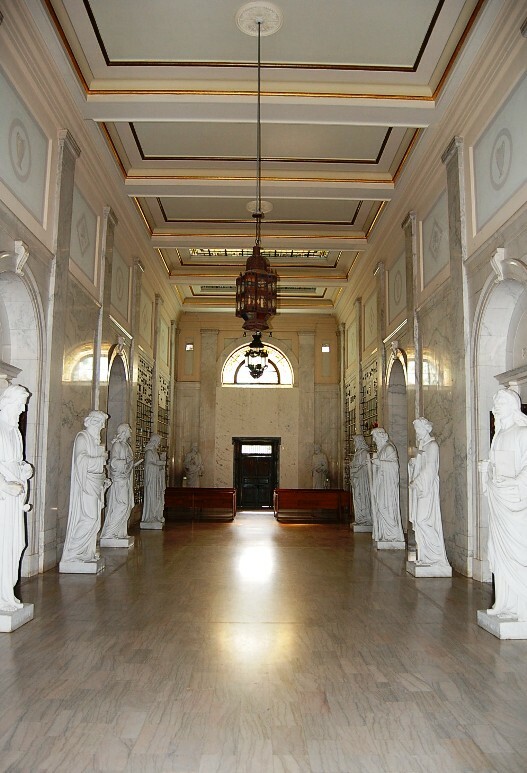 As you enter the mausoleum, walk to the back and take the last corridor to the left. 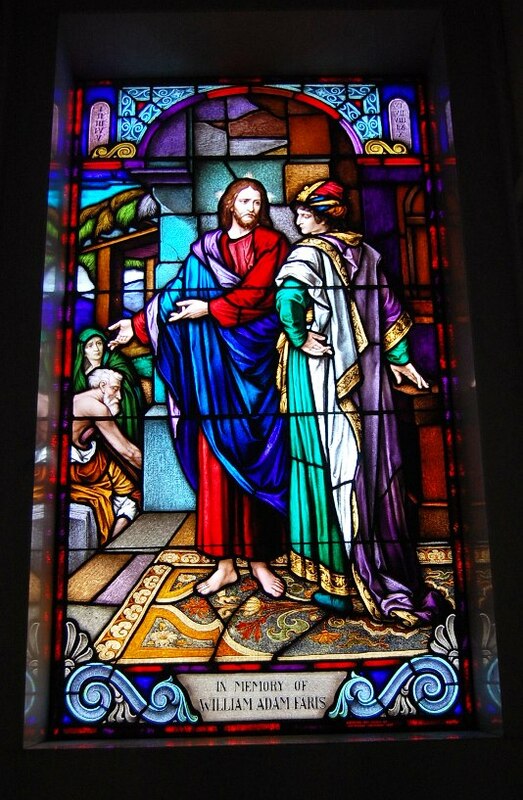 Follow that to the end and make a right and walk toward the stained glass window. 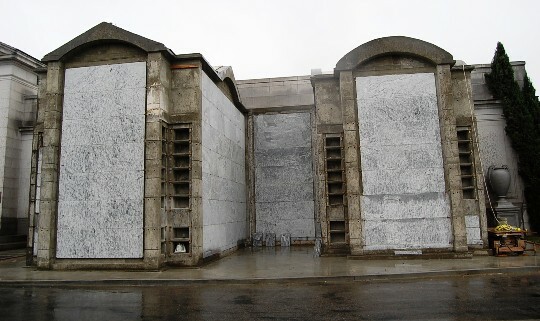 Valentino’s crypt is the last one on the left at eye level. On December 8, 2004, our friend Jimmy Bangley sadly passed away from our lives. 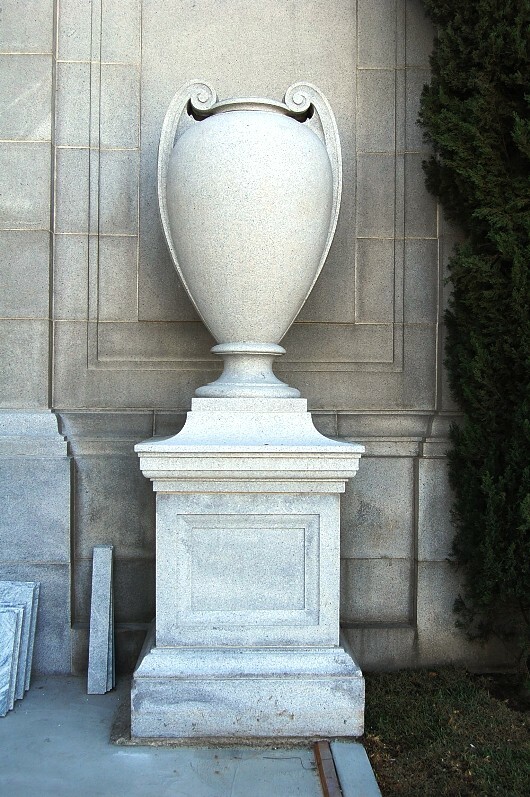 He was returned to his family in Suffolk, Virginia to be interred next to his beloved grandmother. The memorial service the following January was a standing-room-only event. 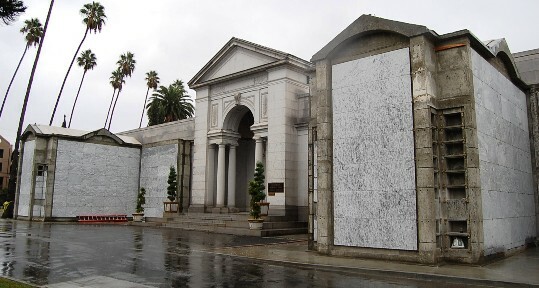 Since then, his friends have made donations to purchase a cenotaph niche at Hollywood Forever Cemetery. A place where we can visit and remember. 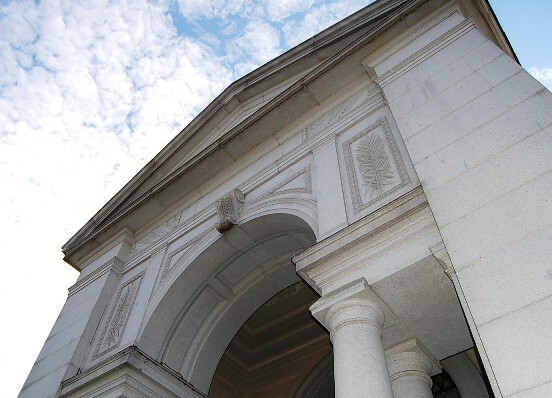 Yesterday, that dream came true when more than 30 friends gathered at the cemetery’s Cathedral Mausoleum to unveil the decorated niche to his memory. For those who did not know him, Jimmy Bangley was an accomplished actor, writer and film historian. 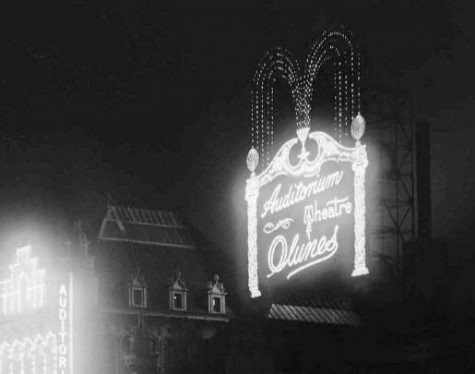 He appeared in numerous plays both here in Los Angeles and his hometown in Virginia. His film credits included roles in the films Rollercoaster (1977), Lost in the Pershing Point Hotel (2000) and the Faye Dunaway short film, The Yellow Bird (2001). He also appeared in more than 200 television programs representing Hollywood memorabilia and film costumes since the early 1990s. Although his first love was acting, he was also a successful writer. 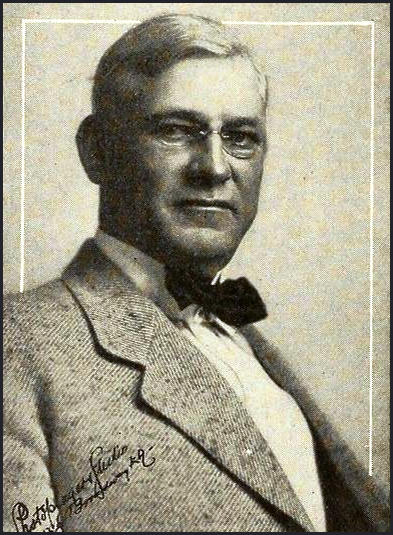 He wrote numerous articles for Collecting magazine, Classic Images and Films of the Golden Age. Over the years Jimmy waited tables, performed stand-up comedy and sold celebrity memorabilia. 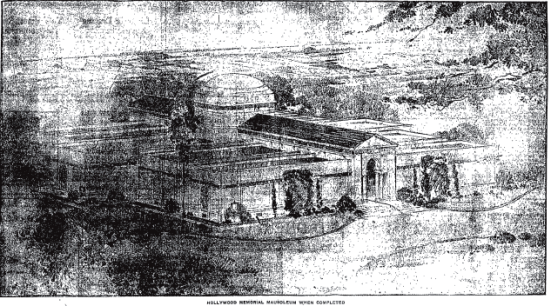 For a while he worked at the Writers Guild and spoke at the yearly Rudolph Valentino Memorial at Hollywood Forever. He was also working on a biography of the “Too beautiful” silent screen siren, Barbara La Marr, with his close friend Margaret Burk. Jimmy was multi-faceted and had his hands in many pies during his brief life.